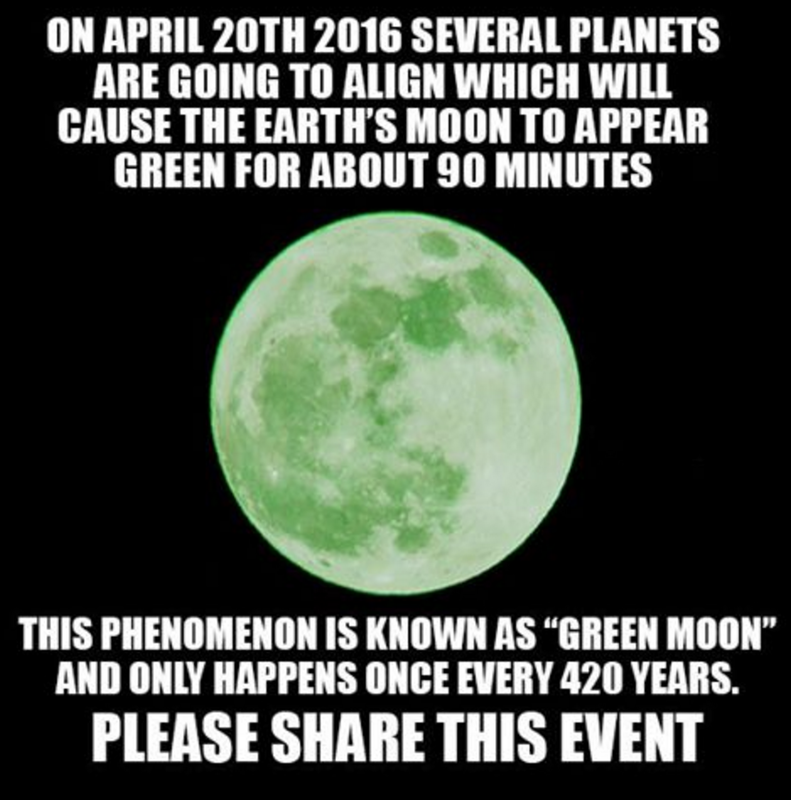 The trending HOAX is Moon turning Green this April 20 and May 29. The biggest trending news going viral on all social networking sites is Moon turning Green on April 20 and again on May 29. Are you one among the people who are waiting to watch the big green moon? Oh come on! Don’t you remember the Red Mars Hoax? It’s just the same again. Let me clear you, there is NO truth in Moon turning into green to night. Do not fall for the false promotions on social media. Green Moon due to the planetary alignment, coinciding on the National Weed day is just a Hoax going viral. The “Pink moon” which will is going to appear on the full moon day of the month i.e. ; on Friday April 22 is also a cooked up story. The scientists at NASA and Space.com have demystified these rumors. This false notion in different blogs claims that the Moon on 20th April and 29th May will appear green in color. The explanation given for this spectacles event is that the green moon is appeared for 90 minutes on 20th April, caused due to alignment of several planets which is rare and takes place once in 420 years. Well, disappointing the stargazers scientists explain that there is no such event going to happen. Mars, Nibiru, Zero-gravity and now, it is green moon hoax message. And unpleasantly, most of the people across the world are implored to share the event on social networking sites. This green event on April 20 is also referred to as “4-20”- is generally identified as National Weed day which celebrates the smoking of marijuana and cannabis culture. Thus, the Green light story is cooked as the predominant color of 4-20 day is green. The original part of the green moon deception indicated that the moon would change to hue on May 29 due to moon positions just 4 degrees from the green-hued planet Uranus. And due to this close interaction moon may somehow acquire green sheen from the green planet Uranus which will obviously do not happen. It notes that the origin of the ridiculous rumor is the Facebook post by Miles Johnson, which was shared 38,000 times on Facebook. It is suggested to develop Critical-logical thinking skills rather than blaming social media for proliferation of such hoaxes.